GET YOUR WORK DONE COMFORTABLY AND SO EASY TO SET UP YOUR OFFICE ANYWHERE! SAY GOODBYE TO NECK PAIN AND SHOULDER TENSION FROM ALWAYS LOOKING DOWN AT YOUR LAPTOP! Quickly plug up the USB cord and turn on the ultra-quiet cooling fans to chill things out! Inside you will find the light weight aluminum stand, the mouse pad that will attach to either side of the stand, a USB cord that will connect to your laptop and power the fans, and 2 clips that can optionally go on the front of the stand to secure your laptop. and also including our gift: Wireless Mouse for you. WHY BUY RAKING PROFESSIONAL MAKER OF LAPTOP TABLE? We provide you only the highest quality products and strive for the best customer service. We are here to assist you however we can, and fully intend to make your work easier through our premium portable desk. There Is no risk - If you do not like the product, there is a 100% money back guarantee.So scroll up to the top and click the "ADD TO CART" button now, before the sale ends!! Light weight aluminum tray + Wireless Mouse Gift- Raking professional office solution maker,makes carrying easy and holds your computer at virtually any position or angle.And we offer one Wireless Mouse Gift for you by FREE. 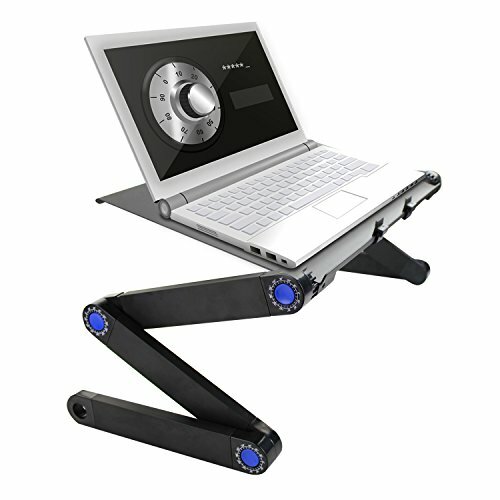 Fully adjustable legs- Rotate 360 degrees and lock in place at various angles. Quickly collapse the stand to make it in any pose,such as sit/crouch/bend over/recline. Multiple uses- Table can also be set up as a TV dinner tray, Sound equipment, Projector, Standing desk, Book tray, Writing desk, and Tablet holder. Silent usb powered cpu cooling fans - Connect USB cord (Included) to your PC to power the quiet cooling fans. And easy to cool your PC when heat emit or comes out. Money back guarantee 100%- If you do not like it or don't need it for any reason, We will sure accept the refunds and give your money back. No questions asked. If you have any questions about this product by Raking, contact us by completing and submitting the form below. If you are looking for a specif part number, please include it with your message.